Paid Listing Upgrades - Now just $10 for 2 weeks! Many OVR subscribers choose to purchase a Listing Upgrade/Paid Service to highlight their rental home and get more views by potential renters. Now, we've added the low priced option to get this added exposure for just $10 for 2 weeks or a longer option of $20 for a full month. 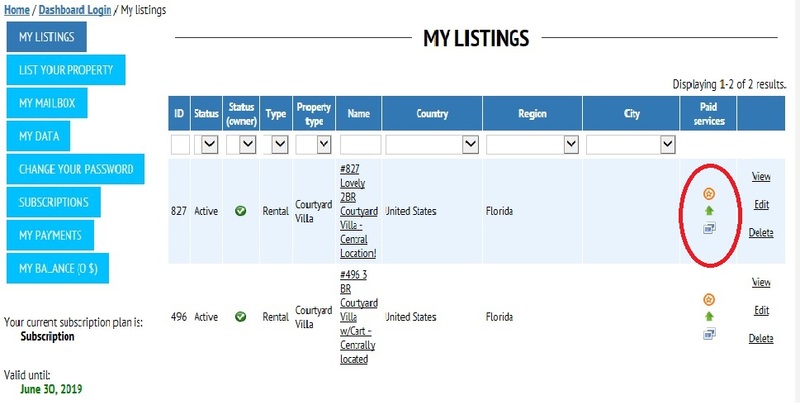 To Purchase a Listing upgrade - you can do so right from your user dashboard. As a reminder - there are 3 Listing Upgrade/paid Services options to chose from. 1. Featured Listing - Listing appears on the Homepage Featured homes section and is tagged with a Featured Homes badge on all listing pages. 2. Homepage Slider Image - Your Main image appears as in the slideshow display on the homepage with your Listing Title (a great way to announce a cancellation opening!). 3. Top of the Listings Results Page - No need to "Bump" your listing - it automatically appears near the top of any Search results or Listing page it appears on.